Eggs, one of gods best creations so versatile and used in many recipes. There are so many ways you can cook an egg. British lion eggs have a wonderful site full of recipes. Start by the very basics by learning “how to make an omelette”, seriously it only takes 2 minutes to prepare and additional 2 minutes to cook. Fancy some “scramble eggs” recipe, perfect to go with those smoked salmon muffins. 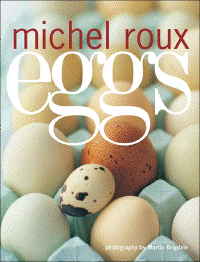 To mark this eggs post I’m throwing a giveaway for Michel Roux “eggs” book. All you have to do is follow the link below to enter. Looks good as i burn my morning eggs. Will it teach me to make the perfect omelette!? haven’t tried the recipe yet, I hope so! have entered the book looks interesting…. Eggs eggs…glorious eggs!!! I love eggs, and always will, my school friends used to get so angry because my mum always made me Egg sandwiches…and Michel Roux is quite hot too!! I love watching him on Masterchef and it would be wonderful to have one of his books in front of me to learn How to cook eggs properly. i never know what to make/bake with eggs. good idea for a book! Great idea for a book, a simple ingredient we all take for granted. Would love to know the definitive way to cook the various forms of this versatile ingredient. Always judge a hotel by the quality of the poached eggs served at breakfast! What an eggsciting prize…. I’ll get my coat! I’d love to win this, I cook most eggs – just not boiled….the perfect boiled egg eludes me!! Good luck all – this has given me a good idea for mums christmas present she loves him! OOhh, I would love this fabulous book! I’m hopeless at cooking and would love to improve! favourite food but need some new ideas. EGGS…. YUMMY, MY FAVOURITE! EGGCELLENT!